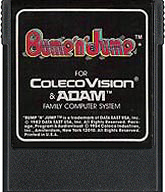 ColecoVision.dk presents: Bump'n'jump © 1982 by: Data East USA Inc. 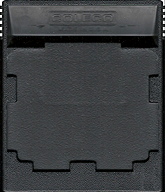 Initially © and Licenses: Data East / Bally Midway Mfg Co.
ColecoVision Game Programmed by: Mattel Electronics / Nice Ideas / Coleco Inc.
ColecoVision GFX Programmed by: Mattel Electronics / Nice Ideas / Coleco Inc.
ColecoVision SFX Programmed by: Mattel Electronics / Nice Ideas / Coleco Inc.
ColecoVision PCB Size, Type and Producent: 24kb., Coleco Inc., Coleco Inc.
Bump 'n' Jump is no ordinary driving game! with the speed and skillful maneuvering of a Grand Prix. Maneuver your way out of a tight spot, then put the pedal to the metal, step up to 220 mph and pull away from the pack. Bump into others cars on the roadway to send them crashing. Jump to clear water hazards or to vault over an opponemt. Land on others racers to earn points and eliminate them from the competition. Race throug all kinds of roadways, each with its own set of hazards. You'll travel over wide four-lanes, narrow cause-ways and oddly jagged two-lanes. Watch out for dangerous center islands, dirt piles dropped by the dump trucks and small water hazards. Coleco's Expansion Module # 2 driving unit gives you the feel of a real road race. Whether you're a driver of Indianapolis 500 class, or a beginner with a learner's permit. Bump 'n' Jump has a challenge to fit your driving skill. Opponent Car eliminated 200 - 500 point. Jumping onto an island 1000 point. Pattern completed bonus -Cars eliminated x 300 - 500 points. Save driving bonus 30.000 points. Bonus racer at every 30.000 points. No Cars destroyed 50.000 points. High Score For The ColecoVision Version Of: Bump 'n' Jump, Skill level: 1. XName: Tom Duncan. XName: ColecoDan. Name: René Nielsen. 1st XScore: 225.152 - October 05, 2010. 1st XScore: 365.812 - July 12, 2010. 1st XScore: 303.710 - March 28, 1986. Name: Troy Whelan. Name: duncantoml. Name: René Nielsen. 2nd XScore: 153.240 - March 24, 2004. 2nd XScore: 225.152 - July 20, 2010. 2nd XScore: 294.836 - April 27, 1986. Name: Scott Bolderson. Name: duncantoml. Name: René Nielsen. 3rd XScore: 55.112 - June 10, 2002. 3rd XScore: 220.624 - January 26, 2008. 3rd XScore: 259.668 - April 13, 1986. Name: Name: Downland1983. Name: René Nielsen. 4th XScore: 4th XScore: 186.404 - April 01, 2019. 4th XScore: 235.710 - November 13, 1986. High Score For The ColecoVision Version Of: Bump 'n' Jump, Skill level: 2. High Score For The ColecoVision Version Of: Bump 'n' Jump, Skill level: 3. 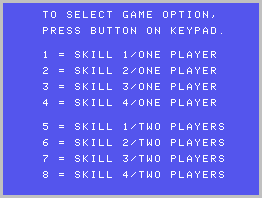 High Score For The ColecoVision Version Of: Bump 'n' Jump, Skill level: 4. 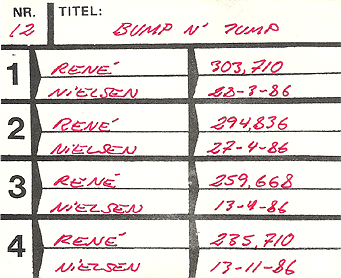 ColecoVision.dk Game # 12, Bump 'n Jump is last updated: April 01, 2019.